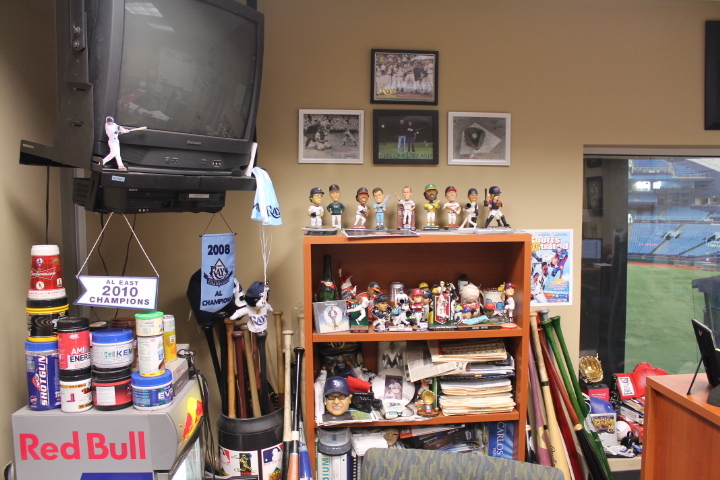 This weekend a valuable cog of the Tampa Bay Rays promotional machine will have stripped off his name badge, put the last box of precious D-Rays & Rays bobbleheads in his car and salute the Tilted cap farewell for the last time as a Rays employee. I decided it was only fitting that this same Rays figurehead we have all seen on the sidelines and walking with celebrities and concert performers should get his last round of applause via a Q & A session. 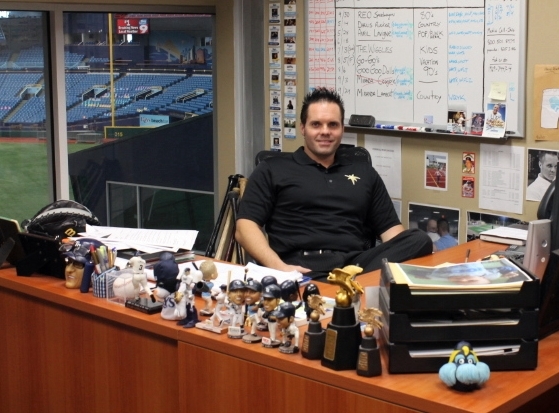 Most members of the Rays Republic have talked to Brian Killingsworth during his rise from the bottom of the Rays promotional food chain to his final position as the Senior Director of Marketing for our Rays. But did you also know he has a MBA from the University of South Florida and also attended Flagler College and Jacksonville University? Even more amazing is this is the same catcher who caught the Wareham Gatemen pitching staff in the Summer of 1997 and who also got to celebrate a 1997 Cape Cod title with current Rays First Baseman Carlos Pena. 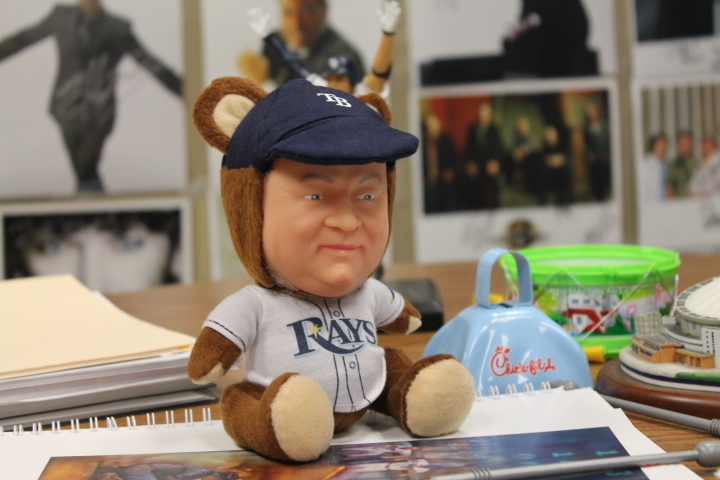 I walked into Killingsworth’s office this past Monday already knowing his next destination, his heartfelt feelings about this great franchise and I decided it was only fitting that I give the rest of the Rays Republic one last glimpse into the man who will take his walk-off jaunt around the Rays promotional bases who was the idea man behind the Rays 2012 promotional item, the Zim Bear. I have got a feeling this one item might just be better than his other promotional gemstone, the Carlos Pena toothbrush holder. There are not many people who get to work in the sport that they love and cherish. What was it about the Rays organization that sealed the deal for you back in 2002 and made you eager to board the Rays staff? Growing up in the Tampa Bay area and St. Petersburg specifically, I followed the teams that almost transplanted here. The near misses with the Mariners, the Giants, and our last second loss of the White Sox. It was tough.Spring Training in this region is incredible. I was an early Cardinals fan because at that time, St. Petersburg was their Spring Training home. I remember back in the Spring of 1995 I was playing a HS baseball game nearby at (Shorecrest) and I told my mom to skip the game and go down to the Trop. to get one of the first jerseys. 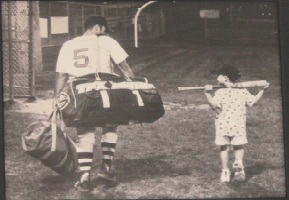 Back then it was the black D-Rays jersey so I could be one of the first to wear it. Being such a fan of the development and the beginning of the Rays franchise in 1998 and to watch this franchise transform and finally turn the corner to fruition is a dream come true. I heard through the grapevine while studying for your MBA at USF you did a thesis on the idea and program that ended up being the basis for the Rays highly popular College Night at the Trop? One of the great things about my MBA and USF is that I got to take a subject I wanted to explore after I graduated and a defined career path. 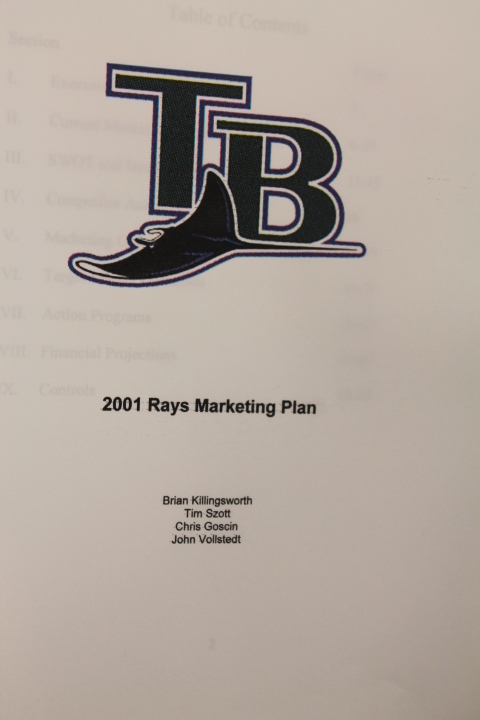 I got a team together and put together a project\thesis for my final year at USF and I picked the Rays as an organization I wanted to study and got to meet people like John Higgins (Senior VP of Administration/General Counsel ), John Browne and other high level executives and submitted my marketing plans for the Rays. The challenge then as it is now, is how to drive attendance and one of the areas I focused on was to drive up attendance among college students and young professionals. In that proposal I came up with the College Night and that was something I was lucky enough after graduating to join the Rays and implement a year later. There was a nice run there where College Nights were full every Friday night, and even sold out for about 3 years in a row. Very excited to put an idea into reality and that was all because of USF and ultimately helped in me landing a job with the Rays. You started out on the ground floor as a Rays employee, who was your mentor, your “Yoda”? My first boss, John Browne (former D-Rays VP of Sales and Marketing ) was the guy who hired me to the Rays and gave me my opportunity. He saw something in me that maybe some other people might have overlooked. He believed in me and one of the things I try to carry on in the manner that John Browne did when he approached his employees. To always take the time to listen and to really “hear them out”. What I mean by that is he eliminated all of the distractions, and nowadays there are even more distractions than there was in 2002. What I try to do is take a piece out of his book and take time with my staff whenever they need me. When we meet on a regular basis we always get away from the desk , away from the cellphones and distractions and I really hear them. We really communicate openly, and I think John Browne laid the groundwork for me to always follow that trait to become a successful manager. 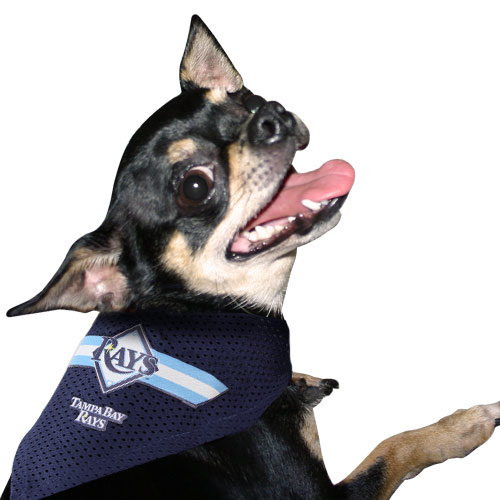 Saw a Tweet recently on Twitter where a Rays fan asked David Price about the Rays possibly doing a Rays dog bandanna for our canine fans? What do you think of that idea? I love that idea. We get some of our best ideas from fans, ultimately they are the consumers of the giveaways and we take all the ideas and expand on them. A dog bandanna is a wonderful idea. We are actually close to potentially doing a Dog Day here at the Trop something we have wanted to explore here for the last 7-8 years and we are finally all comfortable, and I think we got the (St. Petersburg) Fire Marshall comfortable with letting dogs in here. The bandanna would be a perfect tie-in. We actually thought about a dog bowl as well. I have to ask, did the Rays win any outstanding recognition for their 2010 baseball sensation the Carlos Pena toothbrush holder? Is there an MLB version of the advertising Cleo? The Biz of Baseball awarded us with the Number One promotional schedule in all of baseball and the Number 1 promotional giveaway. We were very honored to receive that nomination and our fans reacted to that as well. Carlos Pena thought it was “one of the neatest things he had even seen.” I look forward to Cruz (future Rays LH C ) using it someday. 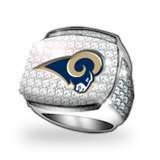 I am becoming the new Vice President of Marketing and brand strategy for the St. Louis Rams. It is definitely bittersweet. I have so many great years putting in 10 years with the Rays. Went through a lot of ups and downs. The team is in a position now where it is built for success on the baseball side. I’m extremely proud of what the organization has done to align itself with the solid foundation on the business side. There are a lot of quality people that are apart of this that can definitely take over the reins, but I’m excited about a new challenge to work in the NFL. I see so many parallels with the Rams with then old D-Rays of 2005-2006 and feel I am getting in with the Rams at a point where we can turn around things on the business side and the football side will take care of itself with a new Coach and a new GM and a new direction that I hope wonderful things will happen with the Rams as well. It is the NFL off-season, but with the NFL Draft only weeks away I suspect you will hit the ground running in St. Louis. Will you take the great groundwork you did with the Rays and convert it NFL-style? I hope so. That is one of the things I’m excited about for going to the NFL is a whole new challenge and a whole new learning opportunity for me. I have a lot of ideas that I have put into practice here (with the Rays) and done successful case studies for that work in baseball and that is one of the reasons I was attracted to the leadership of Kevin Demoff ( Rams Executive VP of Football Operations/Chief Operating Officer) who has provided the direction and laid out what the Rams want to innovate in their business practices and want to do some exciting things. I think I can bring a lot of my ideas there and they will be accepted and we can build the brand. Something that the region will be proud of. That is my challenge to get to work with the wonderful people in their organization right now and do as much as I can to help spread the Rams brand throughout the region and to go it. On a personal note, I remember when your young son Cruz was born you projected him as a future left-handed catcher for the Rays? I got to ask, with the geographical change now, could Cruz have become a possible Cardinals prospect? (Laughing) Maybe, but maybe he can play quarterback for the Rams as well. I hate that this will be the last question, but what will you miss the most when you leave the Trop for the last time as a Rays employee? I’m going to miss a lot. 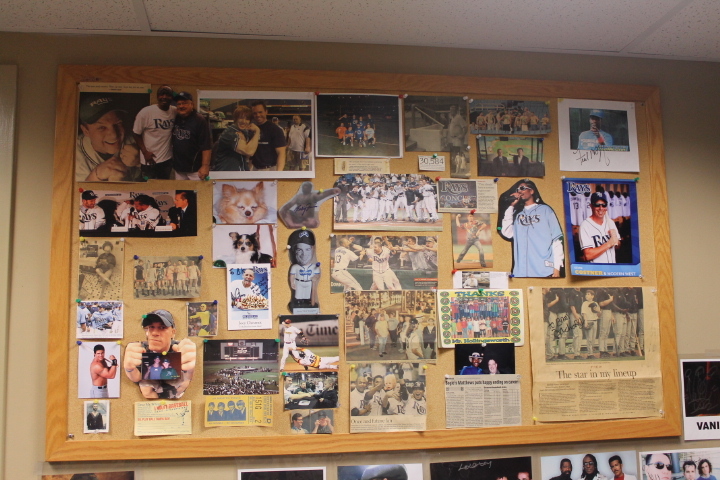 I’m going to miss the friendships made throughout the organization, throughout the game day staff , the clubhouse. There are so many people who I have grown with here that I am going to miss. Most importantly the relationships here, the relationships with the fans. I saw a lot of them at Fan Fest and I’m going to miss seeing kids run through the gates and getting their bobbleheads and getting so excited knowing that I had a hand in bringing some joy to kids and hopefully that part I can carry over to the Ram’s family. I will miss everything about it, the people, the relationships, the building. I am pretty fond of the Trop. Then good thing about nowadays is that you can stay in touch and you can always be close. I will always be a Rays fan, and will watch them on MLB.TV and possibly make a few road trips down. Most of you might not know, but it was Brian who I consulted back in November 2007 asking him if I should again write this very same blog. I am proud of where it has gone, and I have Brian to thank for reminding me why I love writing and this game again. 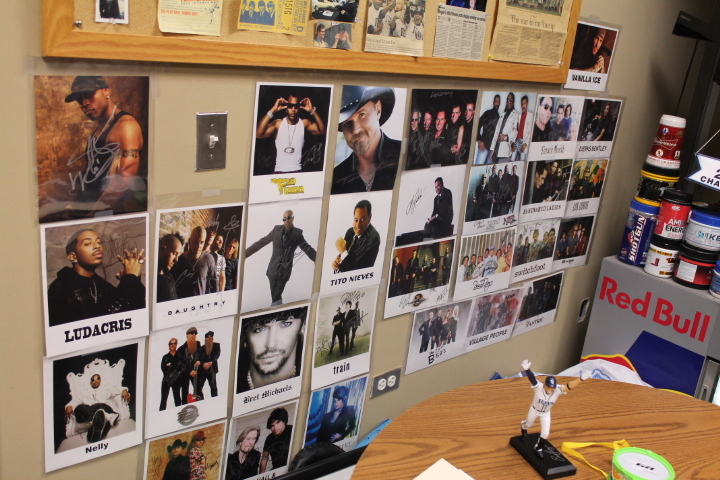 I will miss our seasonal back-and-forth “guessing game” on the Rays concert series. I still write as a result of that first consultation, and many great blog ideas and storylines have transpired because of those emails and chats. Personally I wish everyone who has ever ventured into the Trop. got at some point got a chance to meet, chat with or know Brian in some way. He was an adamant ambassador and treasured asset of “The Rays Way” and I truly wish him more than the best as he re-brands himself now in the NFL. Brian has the passion and true love for this game and his job that so few other people possess or can hold a candle to in sports today. It has been an extreme honor to have met, spoken and known Brian during his Rays tenure. It will truly seem eerie to me on Opening Day when I look down behind Home Plate and do not see you standing there. I know you are going onto something new and exciting, and great challenges await you, but I want to personally wish you and your family not only future happiness, but continued blessings and good tidings. I hope you take your past Rays successes are wear them like a badge of honor, for you have truly served the Rays Republic with brilliance. You said in a recent email the Zim Bear was “your walk-off”. If that is the case, it was an extra-inning Grand Slam off your former office’s window and into the Rays Tank. Nothing else would be more fitting or put an exclamation point on the last moments of your Rays tenure. Wow! From MLB to NFL. 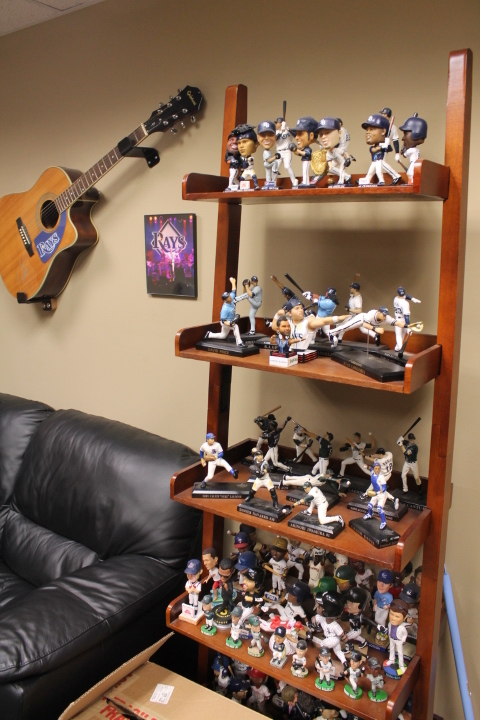 He has quite the collection of Bobbleheads and he seems to be a great person. As always Cliff, well done. Thank you for that comment. 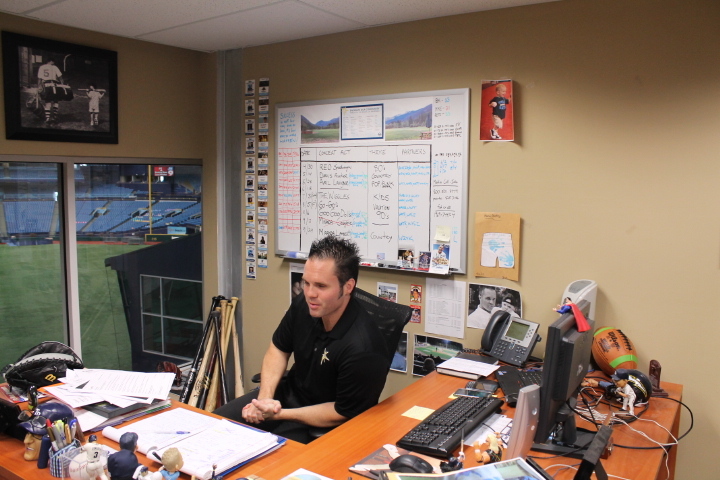 Brian was the one person within the Rays front office who pushed me to write again, and to take photos of the concerts. It has been a learning experience, but one I do not regret at all. Changes are happening fast in that section of the Rays organization, and I look forward to see who steps into Brian’s position….I do not envy him. This blog Q & A was about one of the unsung heroes that so many within the Rays Republic knew by face, but not by his position or stature with the club. Brian is already on his journey to St Louis, and I have lost a great asset both as a Rays friend and a avid follower of my blog. I hated to see a guy of Brian’s talents leave, but a great opportunity awaits him and his family.